Good morning! Hope you're having a wonderful Tuesday! It's time for another Peachy Keen Challenge, and once again, we've got a terrific sketch for ya. There were so many wonderful entries in our last challenge, and I sure hope to see even MORE this time!!! 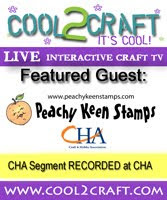 For my card today, I used the new PK-648 Faceless Scarecrow Dolls stamps from Peachy Keen Stamps, as well as the PK-649 Scarecrow Accessories. WOW! What a great combination of sets to create with!! I just LOVE these stamps!! So, here's my card. I was inspired to paper piece this scarecrow after I saw Kim Score's adorable creation that you can view here. I'm tellin' ya, that Kim is one creative lady, and I absolutely love everything she does!!!! Thanks so much for the inspiration, Kim!!! The paper I used for this card is all from Stampin' Up! The card stock AND patterned paper can both be found there, as well as the waffle weave ribbon, the brads and buttons. I used lots of foam dimensionals for this card, and the background for the scarecrow girl was cut with the Nestabilities Labels 21 die. To get the matte layer, I simply traced around the edge of the die directly onto my card stock, and then cut it out by hand. Here's a closer look at this cutie. The image was stamped with Memento Tuxedo Black ink and colored with Copic markers. I even colored the patterned paper to add some shading. That is a great trick, and really adds a lot of depth to the finished project. 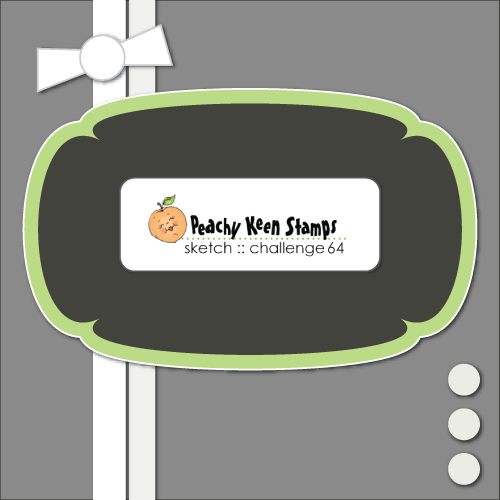 Below, you can find all the details about this challenge, and don't forget to drop by the Peachy Keen Challenge Blog to see what all the DT gals have created using this sketch. Great things await you!!! but if you've got them, we looooove seeing how you create with them! And we'll have a total of FOUR winners!! that is chosen from entries into our challenge. Thanks so much for stopping by The ThINKin' Spot today! It's always a pleasure to have you drop by, and I do enjoy your comments! Have a blessed day, and HAPPY STAMPING!!! Yeah....loving your Mr. Scarecrow! I am loving this dp and how you used it! Thanks for sharing such a delightful card!! AWESOME!!! Love, love, love those papers and you did great with the scarecrow. I would say that you've surpassed yourself my fab friend, but then you're ALWAYS surpassing yourself! I LOVE your fabulously created scarecrow to bits! I LOVE this card! The papers are gorgeous and the paper piecing and shading are FABULOUS!! Beautiful job! Oh my goodness... Lorie, I always love your cards, but I must say, this one is one of my all-time favorites! Your coloring - SUPERB!!! and everything about this card screams Gorgeous!!! Just finding your blog, such cute cards and great stamps. Love the little "scare-girl and Mr. Santa would be fun to win! I don't even know where to begin! Amazing and stunning, love the color combination. Of course your coloring is perfect as always! Not only is your art out of this world so are you. You are an amazing geninue and warm person. Between you all, I don't think I have laughed like that in ages and I defintely needed it! Been craving my jerky...need info!